Coping is such a hard skill. I feel like the longer we fight infertility, the crazier I become in the sense of at all times, always thinking about it. I can enjoy life, but like I'm mentioned in other posts, at best it's like a sliver in my foot. I feel it always, always know it's there and really want it out. I have been doing just okay. Here are some of the major events/thoughts/topics I wrestle with these days. 1. Faith. I guess the biggest change is I have finally gotten the courage to stop asking God for a baby. Heaven knows He knows that is our hearts desire. I have humbled myself to say "Tell me what you want us to do. Show us what you want us to do. Make our hearts desire your desire." As mentioned, adoption is not where we are at right now. We have a Fresh IVF and Frozen IVF attempt ahead. I am willing to stop these treatments if God makes it obvious enough this isn't the way. We are taking a very short break from IVF because of our cruise in May. This gives us a little time to listen for that still small voice. I'm trusting God to give us peace in whatever He decides is best for our life. 2. PGD Testing. Just when I think I have done all I can to have a child (aka IVF) I find out there is yet another test and another huge expense. My RE recommend PGD testing on the embryos. He is a little nervous that even though I have "perfect" 5 day blastocysts, that maybe they are genetically abnormal (missing/extra chromosomes). If this is the case, I will continue with negative pregnancy tests or miscarriages. Since I already had 1 miscarriage it makes him raise his eyebrow. At first I was totally on board (I thought it would be like 5oo dollars) but its 4K. That's like the price of a frozen transfer cycle. And it doesn't guarantee pregnancy. Many women do the test, transfer "normal" embryos and still get negative results. Plus, it brings in this whole new moral view because they could tell me if an an embryo had down syndrome. Is that my place to decide if my baby has that or not? We really really wrestled with this idea. On the plus, they could put in the best of the best of the best and it could be our ticket out of infertility hell. Or they could find everything is abnormal and then maybe we just stop IVF. Sigh. From what I read, most clinics don't really push it unless you have had at least 10 healthy embryos transferred (we have had 4), 3 failed IVFS (2 for us if you count FET), or over 38 (I'm 29). Tough call, but we declined. 3. Embryo Adoption. This hasn't really appealed to me yet but all the sudden it popped in my head. Darren and I both agree we want the baby all of us or none of us. We don't see eye to eye yet on adoption. He wants to go internationally where I prefer the US. I don't know why, but for some reason I want the child to kind of look like us for their sake. I know plenty of well adjusted babies from different countries, but it's important for me. Darren's big thing is he is freaked out in the US that the birth parents will change their mind or that the kid will come from a crazy background. Embryo adoption solves all those problems. I get to bond/carry child, we can adopt from US, AND we can read the background of family. Interesting thought to throw into my blender of thoughts going off crazy in my brain. 4. Pregnancy in my Face. Darren's sister did a real cute announcement about their pregnancy on facebook. It included ultrasounds pics. For some reason, those really haunt me as they take me back to the day I say the empty sack where Jaden should have been growing. The image on facebook threw me back a couple steps. I had Dar switch my password so I could take a break for a bit on my spring break. I hate it. I hate that pregnant women have to feel like they are on egg shells with me. I'm am so happy for them, but so sad for me. 5. Professional Help. I returned to the Christian counselor that I saw back in college when Darren and I broke up. It's crazy to me how similar the desire to be married is in comparsion the desire to reproduce. Two things that are a huge fight/battle for many women. It was helpful to talk with him although he told me to relax to help the sperm travel up the fallopian tube? What the H-E double hockey sticks?? (Pet peeve alert) Dude, we are WAY PAST fallopian tubes. Everything else was fine. 6. The Damned Smiley Face. As also previously mentioned, Darren and I are trying "old school" this month which means I'm on a crazy high level of femera to help me ovulate. I forgot how hot and cold this medicine makes me. It's nuts! I'm on CD 14 and still getting flashes. I've been religiously temping and using the clear blue ovulation predictor kit. I get nervous I won't ovulate every time. I looked at past cycles on this and I usually get the face day 16, 17, or 18. I'm starting to feel myself panic a bit (which is silly since chances on our own are so slim), but hope will not leave my system despite the 24 slammed doors over the last 2 years. I hate the smile face, but when it smiles at me, hope level increases a bit. You should log off Facebook for now until you conceive or adopt, or you've come to peace with the whole thing. 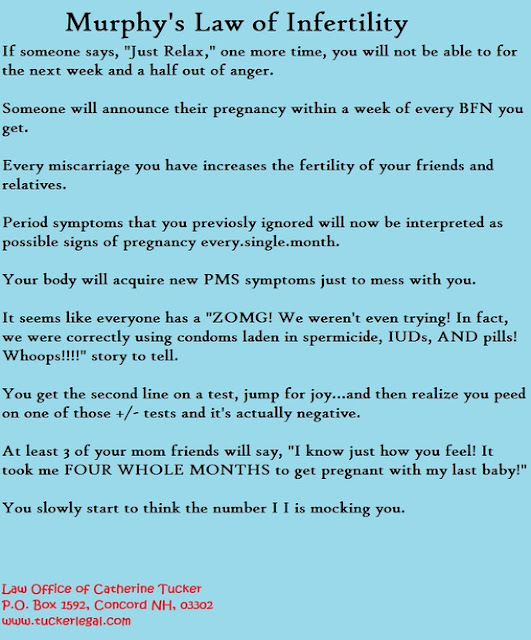 It's not good for women struggling with infertility. I know all too well. As for the #3. I would be the same as you. When we were dealing with everything Brad was open to using donor sperm or vice versa. I think I would have rather been childless than go to that lengths, but that was just me. Hey- I never ever comment on blogs even though I read them all the time. But our story was very similar. I am 28 and my RE suggested the PGD testing and even though we were skeptical I am glad we did it. We had 6 day 5 embryos that they were able to biopsy and we were so excited with the idea of 6 embryos only to finde out that we had 5 complex abnormal (missing multiple chromosomes and would not survive more than a few weeks) and only 1 normal embryo. Although I am sad we only have one it saves me the heartbreak of thinking I had so many chances, embryos, that would only lead to miscarriage if they even implanted. I have unexplained infertility and my husband is fine. I would encourage you either way, but just thought I would share. If you have any questions email me at lanebaxter22@gmail.com. Hey Holly! This journey is so frustrating, especially the waiting parts. It is weird now starting our FET cycle after taking almost a year off. I'm not sure what to expect. I am so gald you are finally asking God what He wants for you guys. I did the same thing for the longest time. I told him I wanted a baby, and got so mad every month when the baby didn't come. When the IVF cycle failed I yelled at him bc I thought that was what He wanted. I guess that was just part of the journey He wanted us to take. Hang in there lady. Ohh and we were going to do PGD testing as well (don't know if you remember that). Unfortunately when we only had two embryos we cancelled the testing. It took a lot of soul searching to find out if we wanted to or not. We ended up not having to though. You know you are always in my prayers! My husband and I are currently praying on embryo adoption. We are kind of in the same boat. I don't care one bit about genetics, but it would be great to give a frozen babe a chance and carry him/her. My husband would rather adopt and have it be more 'guaranteed'. I think it's still a lot to take it that nothing is guaranteed.